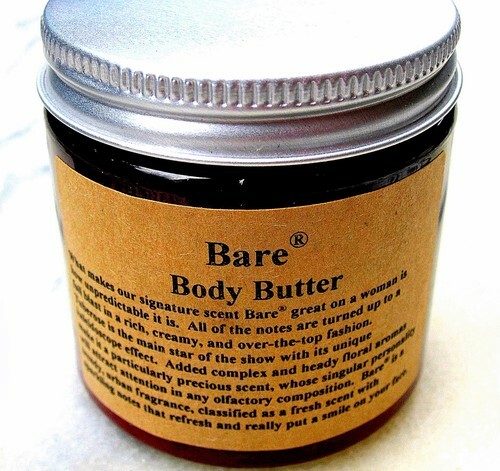 BARE "BARE" Signature (Signature Fragrance) Fragrance Body Butter BARE "BARE" Perfume (signature fragrance)-Tuberose’s kaleidoscope effect is unique. Its complex floral-heady-jasmine-orange- fruity-lactonic-honeyed-indole aroma makes it a particularly precious, unforgettable ingredient whose singular personality will attract attention in any olfactory composition. BAREis a trendy, urban fragrance with some noticeable citrus top notes. This fragrance is classified as a fresh scent with sparkling notes that refresh, and really put a smile on your face. The fragrance sparkles with its citrus, spicy and woody scent possessing a blend of cedar wood, musk, jasmine, and other spices. It is captivating, powerful and elegant. 98% Natural Ingredients Paraben Free A traditional beeswax and borax body butter with origins dating BACK 100 Years. Over 98% natural, highly emollient and having over 50% oil content. Historically, this was called night cream or waterless cream in Eastern Europe. Sunflower Seed Oil, Soya Bean Oil, Jojoba Seed Oil, De-Ionized Water, Natural Beeswax, Emulsifying Wax NF, Sodium Borate, Aloe VeraLeaf Juice, Fragrance, Chamomile, Disodium EDTA. Phenoxyethanol and Caprylyl Glycol. i have to say a few months ago a co worker gave me a sample. I fell in love , head over heals with this smell and rich oil butter lotion. i don't wear perfumes but this surely is my sent of choice. i love it and came on this site to buy more!